This CD is sold to BCS dealers and large customers for repairing, ordering parts and general maintenance. This is a complete copy of this CD. In addition I have added videos of the tiller, sickle bar mower, brush mowers and lawn mowers, snow thrower, and chipper/shredder. You can see attachments you may be considering for your BCS. These videos are on .mpg files. 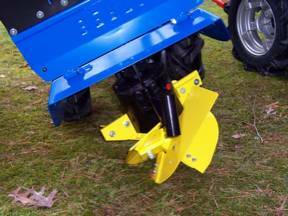 Now added video of the Berta Rotary Plow attachment for BCS two-wheel tractors. This attachment is amazing plowing and tilling in one operation up to a depth of 12 inches. This is all done without over pulverizing the soil and destroying the soil texture. It creates and maintains great raised beds for growing root crops of planting where drainage is a problem. See this attachment on operation in near DVD quality on your Window Media Player. 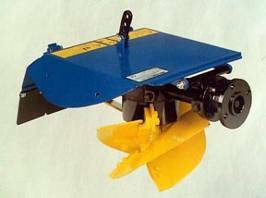 The Berta Rotary Plow is available from us from selected BCS dealers. See below. 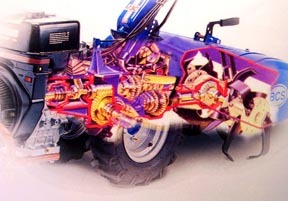 Added part diagrams for Acme ALN330WB and A220B engines used on many older BCS two-wheel tractors. Our supply of used BCS equipment and tractors changes frequently. Please e-mail us for used or obsolete items. We will e-mail you our current used equipment list. We have other dealers who may have the item you need. Here is a link to our temporary site where we have some used equipment listed: Demo and Used Equipment. This rugged attachment is made in Italy by Berta Franco to fit the larger BCS two wheel tractors. It works best on the BCS 732 and 852/853 models. It will also fit the previous model 830 and 850 tractors. With an adapter it will fit the earlier 735, 737, and 605 models. The rear-mounted rotary plow for the BCS two-wheel tractors solves the problem of plowing and rototilling , carrying out both operations during a single pass, leaving the soil ready for sowing. 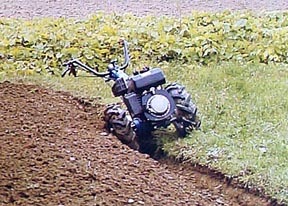 It can be used on grassy land as it ploughs without becoming clogged. It is capable of creating ditches with several passes. Raised beds are created with was few as two passes in opposite direction The Berta Franco Rotary Plow will fit BCS two-wheel tractors with 8 to 14 hp with 5x10 wheels and 5" wheel extenders to give an inner tire width of 16.5" (width between tractor tires). Working width is 10-12", working depth 10-12". Includes transport wheel, deflector plate and safety guard. The transport wheel can be set to reduce the plowing depth. It has replaceable plow tips which can be reversed allowing many hours of plowing.